1. IKEA IKEA IKEA… I don’t know much I can highly recommend it. If you’re looking for new furniture, accessories or decor, IKEA is the place to be. Even if you haven’t got a store local to you, check out their website. I’ve bought almost all of my furniture in my room from IKEA because it’s so cheap and high quality. I love my Malm drawers. They are perfect to hold all my clothes, skincare, bits and bobs and also double up as a blog photo background for when I take my product photos. Yes they come flatpack but get a friend and build them together, it’s quite fun. You tend to find that flatpack furniture is also a hell of a lot cheaper than pre-built. 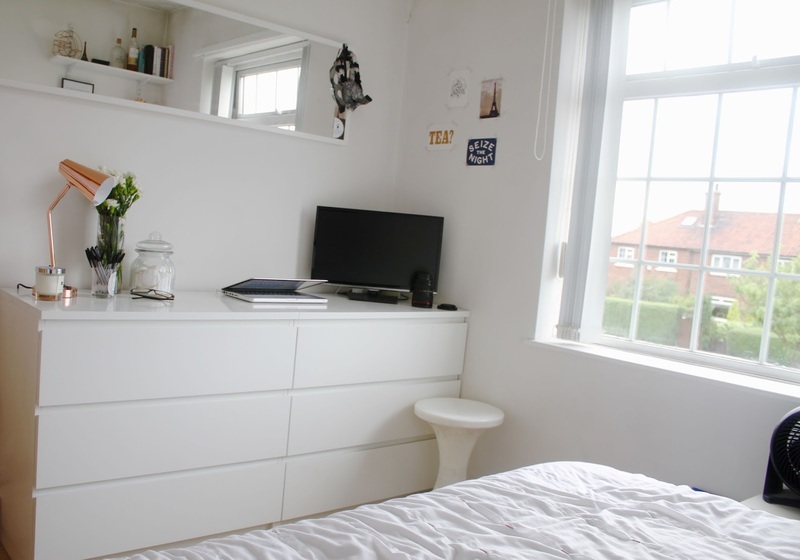 I also got my wall mirror from IKEA (similar here) for only £15!!!! At least 1/3 of the price in other places. 2. Shop around. Whatever you’re looking for whether it be paint, furniture, curtains, blinds… shopping around is your best bet to get the best price. Don’t just buy from the first shop you walk into, have a browse and you may save yourself £5, £10, £100. You never know. Even things like paint from the same brand can have a huge price difference depending on where you go. 3. Think outside the box. 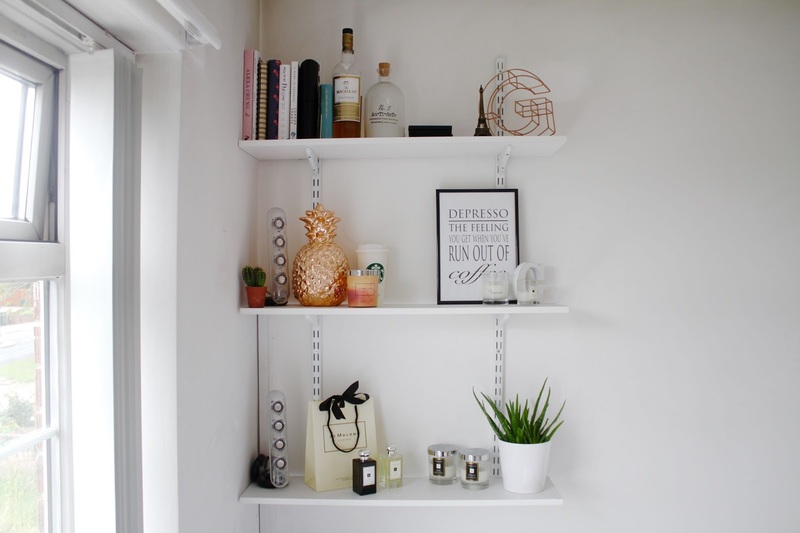 I wanted some shelving in my room, but when I was looking around for three tier shelves they were sooooooooo expensive I couldn’t believe it. Then I had a browse in my local B&Q and came across industrial shelving. They had it all in white too so I was over the moon and it was at least three times cheaper than the other ones I was looking at. If you don’t know what industrial shelving is, it’s modular shelving that you basically build yourself. You buy the wall strips, brackets and shelves separately and it’s usually used in warehouses, garages and sheds just for storage. In a nut shell, I think I’ve done a pretty good job of mine and it looks quite cool too. Jazz it up with accessories, plants, candles and photos. Keep it minimalistic and it will look epic. 4. Go second hand. Check out local charity shops for furniture and decorations. A few years ago I wouldn’t be seen dead in a charity shop and now for homeware I love it. You can get some hardly used, quality items from them and the prices are next to nothing. Charity shops are perfect for feature units, chairs and tables. Again, this links back to shopping around and having a browse for the best before you buy. 5. When buying ornaments, pictures, candles and accessories – shop and buy from independent stores. I love going to those one off, home interior stores you see down high-street back roads. Little independent stores are the best for getting those unique, bespoke accessories everyones like ‘WOW where did you get that from’. 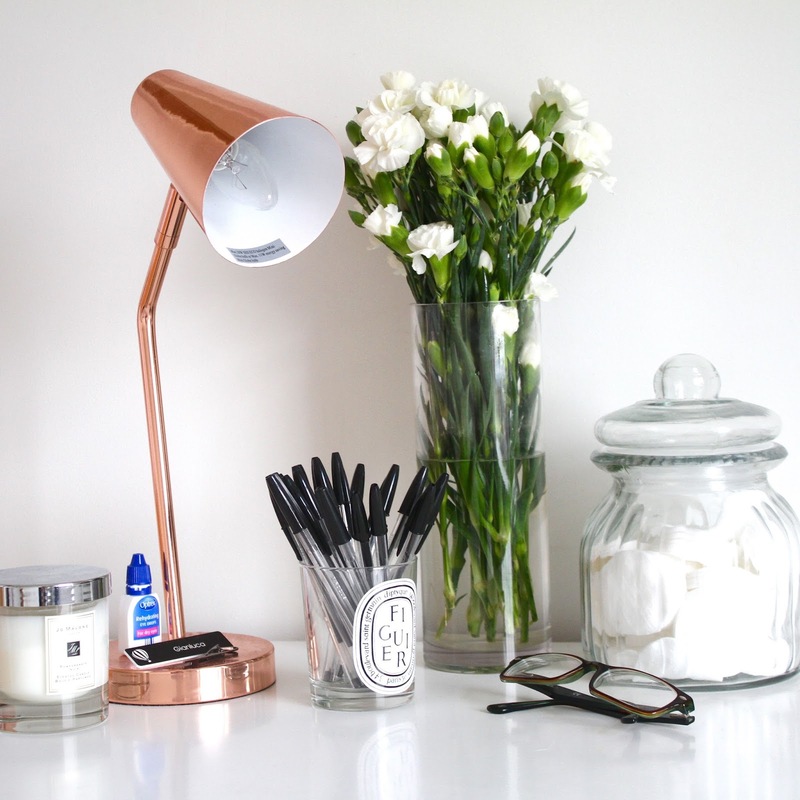 I love things like my copper pineapple, copper G and cotton pad jar. Little accessories that can make a massive difference. Also look at places like Asda Home, H&M Home and Zara Home. Major retailers also have home sections that not many people browse with. These are perfect for those little extras people look for to make a home a home. So there you have it! Decorating can be a long and painful job, but taking it slow usually leaves the best outcomes. What are your decorating tips? *Some products in this review were sent as PR samples. All opinions and views are my own.